Nintendo optical discs are the optical disc format used to distribute video games released by Nintendo. This includes the GameCube Game Disc, Wii Optical Disc, and Wii U Optical Disc. The physical size of a GameCube Game Disc is that of a miniDVD, and the Wii and Wii U Optical Discs are the size of a DVD. GameCube discs can be used with the original version of the Wii and Wii Optical Discs can be used in the Wii U for backward compatibility. A burst cutting area is located at the inner ring of the disc surface. In 2017, Nintendo dropped the disc-based media in favor of game cards for the Wii U's successor, the Nintendo Switch. A section of the BCA of a Nintendo Optical Disc with two of the six additional cuts visible. The GameCube Game Disc (DOL-006) is the game medium for the GameCube, created by Panasonic, and later extended for use on the Wii through backward compatibility. The GameCube Game Disc is a 1.5 GB, 8 cm miniDVD based technology which reads at a constant angular velocity (CAV). It was chosen by Nintendo to prevent copyright infringement of its games, to reduce cost and by avoiding licensing fees to the DVD Forum. This also prevents the consoles from being used as general DVD players. Some GameCube games with large amounts of data span two discs, such as Resident Evil 4 and Enter the Matrix. Multi-platform games that fit on PlayStation 2 and Xbox DVD discs occasionally saw the removal of certain features in order to fit on GameCube Game Discs. Full-motion video scenes and audio are more compressed to fit on a single disc, reducing their quality. Prior to the GameCube, Nintendo consoles traditionally used cartridge-based media. The Wii Optical Disc (RVL-006) is the physical game medium for the Wii, created by Panasonic. Nintendo extended its proprietary technology to use a full size 12 cm, 4.7/8.54 GB DVD-based disc, enabling it to have the benefits of the GameCube Game Disc, while having the standard capacity of a double-layer DVD-ROM. Although the Wii can use double-layer discs, all titles are single-layer prior to the release of Super Smash Bros. Brawl. With the release of Super Smash Bros. Brawl, Nintendo admitted that some Wii systems may have trouble reading dual-layer discs due to a dirty laser lens. Nintendo repaired systems with dual-layer problems, and later released a disc cleaning kit for users to purchase. The Wii U Optical Disc (WUP-006) is the retail physical game medium for the Wii U, with a capacity of 25 GB. The Wii U system software is backward compatible with Wii Optical Discs, but not with GameCube game discs. The optical discs used for the Wii U differ in appearance from most other optical discs in that they have soft, rounded edges. Each Nintendo optical disc contains a burst cutting area (BCA) mark, a type of barcode that is written to the disc with a YAG laser. The data stored in this BCA mark includes an encrypted table related to the hardware-based copy-protection mechanics, in addition to 64 bytes of un-encrypted user-accessible data. A BCA mark is visible to the naked eye. It should not be confused with the IFPI mark that is on all optical discs. BCA is described in Annex K of the physical specification, and can be seen between radius 6998223000000000000♠22.3±0.4 mm and 6998235000000000000♠23.5±0.5 mm. There are also six additional evenly spaced small cuts just outside the BCA radius, which are related to the copy-protection used. 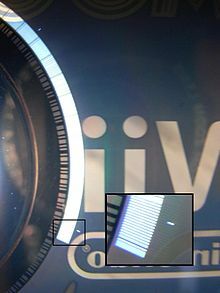 These small cuts can clearly be seen if the disc is held in front of a strong light source. ^ a b "Dvd - Faq". Nintendo World Report. March 7, 2001. Retrieved July 6, 2011. ^ Casamassina, Matt (September 12, 2006). "IGNcube's Nintendo "Revolution" FAQ". IGN. Retrieved September 7, 2006. ^ "Nintendo GameCube Special Edition". Avrev.com. June 1, 2003. Retrieved July 6, 2011. ^ "Beginner's Guide: GameCube". GameSpy. July 30, 2003. Retrieved September 7, 2006. ^ Pian, Sharon (November 11, 2001). "Business & Technology | Let the games begin: The 3-way race is on | Seattle Times Newspaper". Community.seattletimes.nwsource.com. Retrieved July 6, 2011. ^ "Play it again". Smh.com.au. September 13, 2003. Retrieved July 6, 2011. ^ "Wii U will not feature DVD playback - Everybody Plays - Nintendo Wii". Everybody Plays. Everybody Plays. Retrieved July 6, 2011. ^ "Review – Super Smash Bros. Brawl". SlashGear. Retrieved July 6, 2011. ^ a b c "Tobacco smoke makes Super Smash Bros Brawl unplayable on Wii". TG Daily. February 6, 2008. Retrieved July 6, 2011. ^ Scott Colbourne (March 20, 2008). "Not just a smash, a Super Smash". Toronto: The Globe and Mail. Retrieved July 6, 2011. ^ Nintendo of America. "Repair Form for U.S. Residents". Nintendo of America. Archived from the original on March 10, 2008. Retrieved March 9, 2008. ^ Klepek, Patrick (June 8, 2011). "Wii U Does Not Play GameCube Games". Giant Bomb. Retrieved July 6, 2011. ^ Gilbert, Ben (November 12, 2012). "Take a very, very close look at the round-edged Wii U proprietary discs". Engadget. Retrieved November 18, 2012. ^ "2011 E3 Expo Analyst Q & A Session". Nintendo. June 8, 2011. Retrieved July 1, 2014. ^ a b "» Anatomy of an Optical Medium Authentication (Part 1)". debugmode. Retrieved May 21, 2013.